The Nemesis of Crime returns in classic pulp novels by Norman A. Daniels writing as "G. Wayman Jones." First, when murder pays off in millions, "The Black Bat's Justice" snarls a corrupt killer's ingenious web of doom! 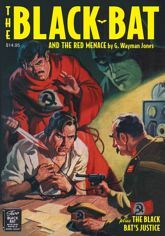 Then, Tony Quinn follows the trail of Soviet saboteurs who seek to undermine America's defense effort in "The Black Bat and the Red Menace." GOLDEN AGE OF COMICS BONUS: The Mask returns in TWO illustrated adventures by Kin Platt from Nedor's EXCITING COMICS. This instant collector's item showcases the classic color pulp covers, original interior illustrations by V. E. Pyles, and historical commentary by Will Murray and Anthony Tollin. Softcover. 128 Pages. 7" x 10"